Over 3/4 of Victoria Azarenka’s 10,595 WTA ranking points were earned on hard courts, her best surface. The World No. 1 earned 2210 more points than Serena Williams on hard courts. Of course, hard courts comprise a larger part of the WTA Tour than clay and grass, but Azarenka performed particularly well on the surface, ending the year with an impressive 47-5 record (winning more than 90% of her matches). Even more importantly for rankings’ sake, Azarenka was 13-1 in hard court Majors. Azarenka was less stellar on clay (12-3, or 80%) and grass (10-2, or 83.3%), but still quite solid. Maria Sharapova, who had won just three clay court titles before 2012, racked up an astonishing record on clay this year, going 18-1 (94.7%) on the surface, and winning three more clay titles, including the French Open. Her record on grass (8-2, or 80%) and hard courts (33-8, or 80.4%) was also good, but it was her clay season that cemented her No. 2 ranking. Serena Williams went undefeated on grass this year, earning the maximum number of points at Wimbledon and the Olympic Games. 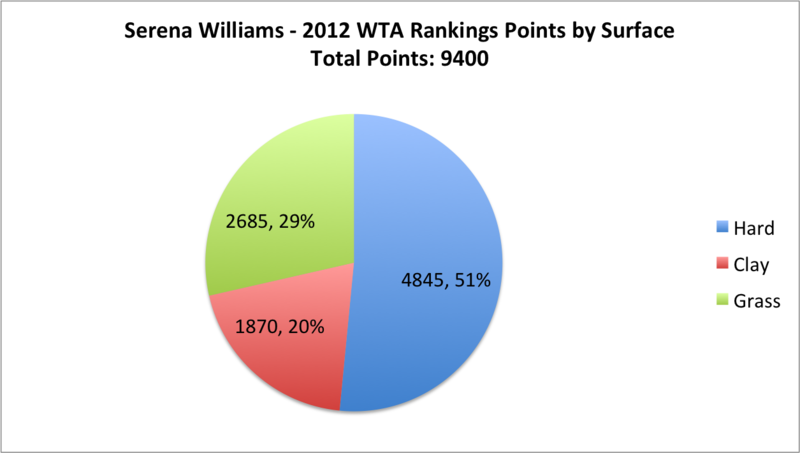 Her run at those events helped her ranking, but she was also quite good on hard courts (26-3, or 89.6%). 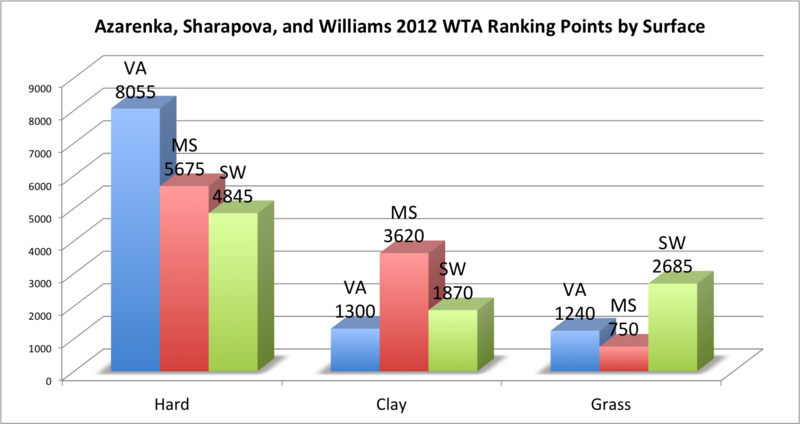 The interesting part of Williams’ season is her strong record on clay (15-1). Though Williams started the clay season extremely well, winning Charleston, going 2-0 in Fed Cup, winning Madrid, and reaching the semifinal in Rome before pulling out with a stiff back, her first round loss at Roland Garros still cost her greatly in the WTA rankings. Williams left Roland Garros with just five WTA ranking points to show for it, and though many have speculated that she could have a higher ranking had she played more tournaments (which is true), she also could’ve improved on her ranking had she performed better in the biggest clay tournament of the year. A big thank you to the WTA’s Kevin Fischer, who provided the rankings data. You can view these surface breakdown charts for all of the top 8 players over at Drop Shot Dispatch.